Note: This article, by EdNC staff, was originally published on Education NC (EdNC –The evolution of Davie County’s elementary schools) and is republished here with permission. With the help of the Mebane Foundation, Davie County has embarked on a mission to improve reading in its elementary schools. 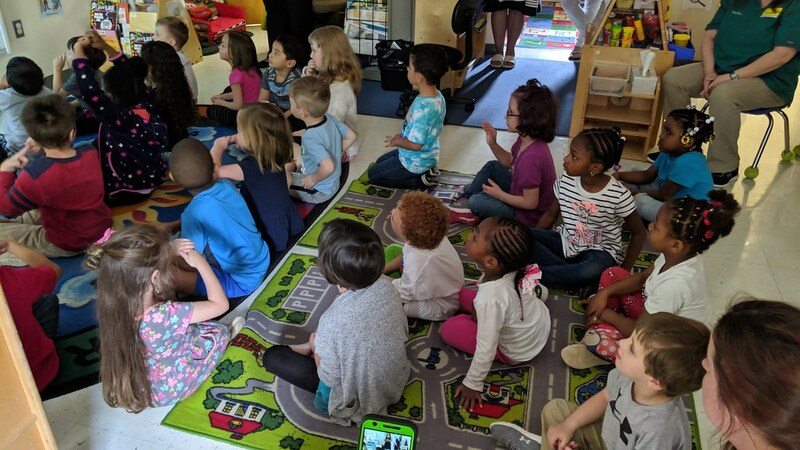 Yesterday, EducationNC talked about the success the DavieLEADS grant has had in helping turn around Cooleemee Elementary, but the initiative is active throughout the other area elementary schools as well. DavieLEADS is a five-year, $2.5 million grant, with a specific goal to get kindergarten readiness from 70 percent to 90 percent and reading proficiency in third grade from 60 percent to 80 percent by 2022. It began in the 2017-18 school year and the success is already starting to show. After the 2017-18 End-of-Grade test results were announced, the county discovered it had moved up from 45th to 17th out of all 115 districts in the state for third-grade reading proficiency. Mocksville Elementary is another school that has seen impressive gains from the initiative. When the 2017-18 EOG results were announced, the school found out its grade-level proficiency in third grade had increased to 64.9 percent from 52.9 percent the year before. Teachers and staff who work at the school attribute that to many things, but it’s not hard to draw a direct line to the work of DavieLEADS. Madison Wyatt and Suzanne Doub, both third grade teachers at the school, point to the work of the Professional Learning Communities (PLC) from last year. PLCs are essentially where teachers can get together at the school to discuss the standards they’re working with in the classrooms and get a better grasp on how to teach to them. The focus of the schools working under DavieLEADS last year were these PLCs, while this year they are focusing on implementing guided reading. Wyatt said that the PLCs last year focused on understanding and breaking down the standards so that teachers knew how to really teach them. “Really, honestly, you can be handsome on a standard … but what are you teaching and how are you teaching it?” she said. Wyatt explained how she might go about teaching one particular standard: making connections in a text through sentences and paragraphs. That standard includes a lot of different skills, such as compare and contrast, cause and effect, and understanding sequences. She said she would start out with fiction reading, because it’s easier for teaching cause and effect and compare and contrast. She would focus on one skill in a week, say compare and contrast. The next week, the students would move on to cause and effect, but meanwhile, she would also be looping back to the skill they learned the week before. She does that with each new skill set, introducing a new one while revisiting prior ones. She said that prior to the PLCs, standards were taught far differently. Doub said another part of the PLCs last year was getting a firmer grasp on where kids were coming from and where they needed to go. For Meaghan Irons, this is her first year at Mocksville teaching third grade. But watching her more veteran colleagues, she is not at a loss for why the school has improved. She said the support she has gotten in Davie County has been phenomenal, and that’s thanks in part to the literacy coaches and professional consultants brought in using funds from DavieLEADS. “I have literally probably gotten more support and more training in the last year I’ve been here than I got in the last five years at my last school,” she said. Different schools in Davie County have different levels of needs and resources, and sometimes it doesn’t pay to be well off. While Mocksville and Cooleemee are both Title I schools, meaning that at least 40 percent of the children in the school are low-income, Shady Grove Elementary School is not. That comes with certain advantages, but also some disadvantages. Title I schools are eligible for federal funds that can help with school programs, but Shady Grove doesn’t get any of that extra money. For Shady Grove Principal Sarah Maier, DavieLEADs has helped fill in that gap. “The level of support that you get is amazing,” she said. She previously worked in Davidson County where she was most recently at a non-Title I school. There was no reading specialist or instructional coach. Any new programs or initiatives that were introduced were the responsibility of her and her assistant principal to implement. Guided reading, the centerpiece of Davie County’s strategy this year, is part of what’s called a balanced literacy approach, and here’s how it works. There are different elements that are rotated. One is where a teacher reads aloud from a text that is above grade level. Here, students are just listening. Then there is teacher-directed reading. That is grade-level text that each student is holding or viewing via projection. 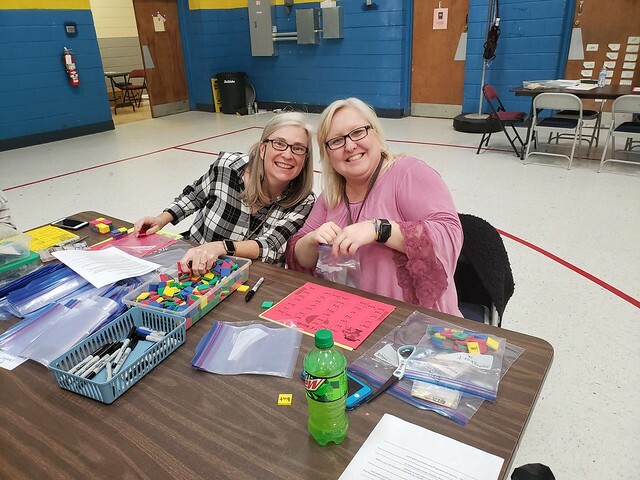 “Whether they are on grade level or above grade level, that is their window into how to read grade-level text,” said Nancy Scoggin, one of the consultants who came in to work under the DavieLEADS grant. She said this is the portion where standards are explicitly taught. Then there is guided reading. These are small groups of students reading texts at their instructional level with the help of the teacher. “It’s all about the mistakes that they’re making, so that we can see what to do next,” Scoggin said. These components, combined with writing and working with words, comprise what is called balanced literacy, and they are the components of the guided reading model Davie County is using. In the video below, Kelly McGilvary, a third grade teacher at Shady Grove Elementary, explains guided reading and what it looks like in her classroom. The model of guided reading used in Davie County is based on the work of literacy expert Jan Richardson. Schools may say they’re using a guided reading method, but not all strategies are created equal. Julie Fletcher is a third grade teacher at Mocksville. She has been teaching for 22 years, but this is only her third year teaching third grade. Prior to that, she was a second grade teacher. She said implementing the Jan Richardson model has been a huge change. The foundation of reading is understanding how words work, and that’s where Letterland comes into play. This is a phonics-based program that aims to teach students aged 3 to 8 how to read, write, and spell. Letterland played an integral role in helping improve Cooleemee, but it’s also implemented throughout Davie County’s elementary schools. Amy Spade, a literacy coach at Shady Grove Elementary, is a huge champion of Letterland and its efficacy in helping make kids literate. “Letterland is like a small island that all these Letterland characters live on. So all the letters become characters,” she said. For example, A is Annie Apple. “The kids meet these characters to learn their letters and sounds, how to spell, how to read,” Spade continued. In the video below, Spade goes in depth into Letterland. Larry Colbourne, president of the Mebane Foundation, spends a lot of time visiting the schools his organization is helping. He enjoys seeing the academic progress the schools are making, but especially at this early stage (not even two years in), he’s even more excited at how staff are responding to the changes being made. The journey to third graders reading on grade level begins long before third grade, however. It even starts before kindergarten, and that’s where the other part of the DavieLEADS plan comes into play. As mentioned before, one of the goals of the grant is to increase kindergarten readiness in the county from 70 percent to 90 percent, and that means working in preschools.